Introduction:	Anhydrous Ammonia (AA) is a caustic compound commonly used in the industry that can cause burns, even with brief contact. As with other alkali burns, the early washing to remove the AA from burnt areas is crucial to limit tissue damage. The concentration of toxic agent and duration of its contact determine the degree of skin and mucosa destruction. A tanker truck carrying AA (NH3) fell off a highway, and released a dense cloud of AA gas. Fifty-four people inhaled the gas and after ninety days, three people were still experiencing hoarseness and were examined. Case Report:	We assessed three patients with laryngeal sequelae due to AA inhalation burn. We found a case of hyperemia and edema, one case of granuloma of the posterior third portion of the left vocal cord, and one case of vocal cord adhesion. Necropsy findings are commented both macroscopically and microscopically. The sequelae and the best treatments for them are discussed herein. Due to the large increase in the use of pressurized liquid AA in agriculture and industry, the accidental exposure and consequent gas inhaling have been increasing (2). The most usually found lesions produced by caustic chemical products, acids and alkalis are caused by the hydrofluoric and formic acids, anhydrous ammonia, cement and phenol. Other specific chemical agents that may cause burns are: phosphorus, nitrates, hydrocarbons and pitch (4). The AA intoxication occurs after accidental exposure during manufacture of fertilizers, textile fiber, leather, plastic, pesticides and explosives. It also happens during refrigerators installation in which it is generally used (5). Recently we could examine three people with dysphonia for more than 90 days, after AA inhalation, caused by an accident of tanker truck that fell off in a highway of the São Paulo sea shore that let the gas leak onto the neighborhood along the highway. In this neighborhood, 54 people inhaled the gas and were attended in the emergency rooms and hospitals around the place. The objective of this study is to report three cases of laryngeal sequelae due to accidental inhalation of AA and to make a literature review. We examined three patients, after 90 days of the accident, for they still presented with dysphonia, in spite of the treatment with antibiotics, corticosteroids, shower with abundant water, intense washing of the eyes and oxygen therapy, instituted by the doctors at the hospital where they were attended. Case 1 - ENS, 26 years old, female, white, housewife, presented with normal otorhinolaryngological exam, except for the vocal cords that, upon video-laryngoscopy, presented with hyperemia, slight edema and bilateral leukoplakia in middle third (Picture 1). She was medicated with corticosteroids and phonoaudiologic therapy was recommended. Picture 1. Chronic laryngitis Video-laryngoscopy showing hyperemia and edema of vocal cords with leukoplakia, bilaterally. Case 2 - SRB, 40 years old, female, white, housewife, didn't improve from dyspnea with the treatment carried out in the hospital, we needed to perform tracheostomy, and she was interned for 30 days. The tracheal cannula was removed and the tracheostoma was closed after 60 days, but dysphonia remained. The otorhinolaryngological exam was normal, except for the vocal cords, that in the video-laryngoscopy presented with hyperemia, moderate edema, and granuloma located in the posterior 1/3 of the left vocal cord (Picture 2). She was medicated with corticosteroids and phonoaudiologic therapy was recommended. Picture 2. Chronic laryngitis with granuloma. 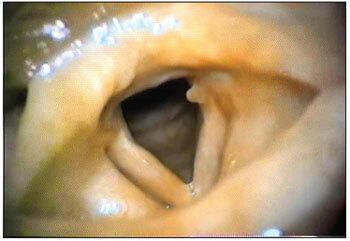 Video-laryngoscopy showing hyperemia, edema and granuloma in the posterior third portion of the left vocal cord. Case 3 - MCF, male, 23 years old, white, farm worker, had intense dysphonia and dyspnea with slight efforts. The otorhinolaryngological exam was normal, except for the vocal cords, that in the video-laryngoscopy presented with hyperemia and adherence of all the anterior and middle third, with bilateral granulomas in the posterior comissure which led to stenosis of the glottis region (Picture 3). He was medicated with corticosteroids and after 60 days the granulomas disappeared and stenosis remained (Picture 4); phonoaudiological therapy was indicated after surgical treatment. Picture 3. 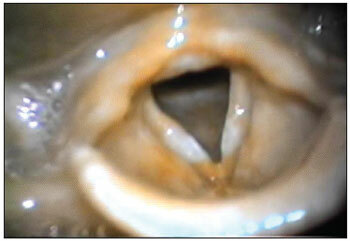 Adherence of vocal cords with granulomas. Video-laryngoscopy showing vocal cords adherence with cicatricial granulomas. Picture 4. Glottic stenosis. Video-laryngoscopy showing the vocal cords adherence and consequent glottic stenosis. Ammonia is known since antiquity. In his Historie Naturalis, Plínio mentioned the existence of a variety of salt called Hammoniacum. In 1661, Robert Boyle wrote in the Sceptical Chymis that the ammoniac salt is composed by a muriatic acid and volatile alkalis. In 1774, Joseph Priestley was the first to isolate the gaseous ammonia, which he called alkaline air (6). The AA alkalis chemical symbol is NH3. It has room temperature, like an colorless gas, with a strongly pungent odor similar to dry urine. The ammonia water is a solution of ammonia hydroxide at 10-30% It's a colorless liquid with intense, pungent and suffocating odor (7). For containing 82% of nitrogen, the AA is taken as the strongest source of this element. It's an excellent fertilizer and thus highly used in agriculture. It's also used in the synthetic fibers manufacturing, such as nylon and rayon, as well as tincture and natural fibers washings. The ammonia oxidation produces nitric acid, used in the production of trinitrotoluene, nitroglycerin and other substances. It's also used in refrigeration (9). It presents fire and explosion risks because as it's an inflammable gas, it forms explosive mixtures with the air in the range of 16-25% of the air volume (10). The AA irritates the eyes, nose and airways intensely. Among the toxic effects it includes lacrimation, breathing difficulties, chest pain and pulmonary edema. A concentration of 10 ppm may be detected by odor; the eyes and nose irritation is perceivable with about 200 ppm. The exposure for a few minutes at 3000 ppm may be intolerable, causes severe skin bleeding, pulmonary edema and asphyxia, and leads to death. It's corrosive for the skin because it reacts with moist to form the caustic ammonium hydroxide. A prolonged exposure may cause tissue destruction (10). The contact with the skin determines severe and extremely painful burn. There is an initial edema with formation of vesicles and then there occurs liquefaction necrosis, that deepens progressively and undergoes second-intention healing (7). The contact with the eyes depends on the time of exposure. If it's quick and not much intense, it produces conjunctivitis, lacrimation and photophobia. In the most severe cases, there occurs intense pain of conjunctive, eyelids and corneal ulceration (7). The clinical case presented by the people who were intoxicated depends upon the type of exposure. The elevate pH ingestion, above 12, is severe and generally associated to deep ulceration of mucosas, mainly those of the esophagus. Other influencing factors are: volume, concentration, viscosity and molarity. The alkalis produces liquefaction necrosis, saponifies the lipids and makes the proteins dissolvable which favors the lesions deepening. Right after ingestion, there appears intense pain, glottic spasm that in one hand impairs the entry of a higher quantity of gas and in the other hand may determine an immediate death for asphyxia. There occurs intense pain, burning, injury in the mouth, throat, retrosternal region and stomach. The occurrence of vomit is common, which may be in coffee sediment. We observe a difficulty for eating in all cases. The dehydration is intense and of quick beginning with arterial hypotension and shock, that may evolve to death. The chemical lesion presents a pseudomembrane feature of gray or dark gray coloration. Solid products more often determine lesion in the mouth, pharynx and upper region of the esophagus. The ingestion of liquid products, generally more severe, may produce circular esophageal lesions that systematically evolve to cicatricial stenosis. Edema and inflammation of mouth, tongue, pharynx and larynx diminish the airways size and facilitate the appearing of pulmonary complications. There may be aphonia, coughing, stridor, dyspnea and cyanosis. After the initial phase, the appearing of fever, retrosternal and abdominal pain indicates a possible esophageal perforation with mediastinitis. In the other hand, stomach perforation is rare. The esophagus cicatricial stenosis is the most common sequel (7). Inhalation produces intense breathing irritation, with cough, dyspnea and increase of bronchial secretions and, some time later, pulmonary edema, with worsening of dyspnea and appearing of cyanosis. Respiratory disorders may be associated to other systemic manifestations, such as headache, dizziness, weakness, arterial hypotension and tachycardia. The exposure to large concentrations may determine immediate death. Cough, dyspnea, stridor, cyanosis and vagal reflex, leading to glottic spasm, are always present; The passage of alkalis to the trachea generally determines immediate death for suffocation. Coma and convulsion are almost always terminal manifestations (7). In an autopsy of a person, Sobonya (11) described the pulmonary morphological and morphometrical changes that led to death, two months after exposure and inhaling of AA. The pathological findings include lower lobe bronchiectasies, obliterating fibrosis of the lower airways and terminal pneumonia. The lower airways obliterating fibrosis is a characteristic of the late stage of the disease, that led to bronchiolitis, probably responsible for obstructive pulmonary disease and survival of the patients who inhaled AA. Close et al (1) mentioned that the AA exposure may result in significant damages to the respiratory system, eyes and skin. They carried out a retrospective study and presented the acute and chronic respiratory complications in 12 patients exposed to AA, as a result of the said accident, and concluded that: 1) The exposure to the AA smoke, in high concentration for a short period of time, affects the skin, the eyes and the upper airways. Moreover, there may occur severe burns in the mucosa of nose, mouth, pharynx, larynx and trachea and even upper airways obstruction. We recommend the early intubation or tracheostomy. These patients may be cured, but with some pulmonary sequel. 2) Patients who inhaled AA in low concentration during a long time didn't present with acute obstruction of the upper airways. The gas inhaled combines with the water of the whole moist surface of the mucosa, which results in extensive alkaline burn of all the tracheobronchial tree. In the beginning there are a few signs and symptoms. There may occur burn of all the pulmonary mucosa, which results in a small pulmonary lesion and edema. As a result, there may occur moderate to severe chronic pulmonary disease. 3) Patients exposed to AA moderate quantity inhaling during a long period of time may present with a few or no clinical or laboratorial finding. Although the best treatment is not defined, it would probably be advisable to include steroids, antibiotics and mechanical ventilation in the treatment. In the exam of tracheobronchial tissue with electronic microscopy we confirmed that, in the acute death, there occurs denudation of the tracheobronchial epithelium, edema of the own lamina, signs of alveolar edema, congestion and hemorrhage (12). By following up for many years a patient who never smoked and was victim of massive exposure to AA gas, Leduc et al (5) verified that, in the acute phase, the patient presented with severe tracheobronchitis and respiratory insufficiency caused by severe burns in the respiratory tree mucosa. After the acute phase, the patient maintained significant respiratory obstruction. Studies of the mucociliary clearance, computed tomography and bronchography showed moderate bronchiectasies. They concluded that the acute exposure to high concentration of ammonia could result in acute respiratory insufficiency, which, in time, also led to a chronic alteration of the respiratory function. The AA is a caustic combination used in industry and may cause severe burns even with a brief contact. As occurs with other alkalis burns, the early washing removes the ammonia from the areas burnt and is crucial to limit the tissue damage. Two cases of identical exposure to AA steams were studied by Latenser et al (13), and the first one was washed with water immediately after the exposure, and the other was washed only when the patient got to the hospital. The first one underwent lower burns and obtained medical discharge after two days of interment. The second patient had burns in 14% of the corporal surface and significant inhalation lesion, and intubation, mechanical ventilation and skin graft were necessary during 13 days of interment. The early treatment reduces significantly the severity of the burn. Edlich et al (14) described that physiopathologically most chemical agents damage the skin, more by means of a chemical reaction than for a hyperthermal injury. Although some chemical agents produce considerable heat as a result of an exothermal reaction when in contact with water, they end up producing chemical changes directly on the skin and result in higher damages. The chemical changes depend upon the agents, whether acid or alkaline ones. The concentration of the toxic agent, as well as the duration of the primary contact, determines the degree of destruction of the tissues affected. When the skin is exposed to the chemical action of the caustic substance, the keratin cover is destroyed and the skin tissues are exposed, there occurs a continual necrotic action. The alkaline chemical products dissolve the protein and the collagen, which result in these molecules alkaline complexes. There is also cellular dehydration and saponifying of the fat tissues. Differently from the acid burns, that are dry and with slight edema, the alkaline ones are marked by edema, large moist and loss of liquid. The alkaloid exposure neutralization is carried out by irrigating the burnt place with a great amount of water to dilute all the alkaloid present in the injury surface, which still didn't produce reaction (14). The chemical burns keep on destroying the tissues until the causing agent is inactivated or removed. When hydrotherapy begins after the contact of the chemical product with the skin, within one minute, the severity of the lesions is lower than when it takes 3 minutes, for instance. The early treatment normalizes the skin pH. The time of the caustic contact with the tissues determines the lesions severity. The soft irrigation of the skin, with a large volume of water and low pressure, for long time, dilutes the toxic agent (14). After exposure to a strong alkaloid, the prolonged hydrotherapy is specially important to limit the injuries severity. In experimental animals, the pH of the chemically burnt skin does not approach the normal concentration, unless we maintain one more hour of continuous irrigation and, even so, in spite of the hydrotherapy, it does not return to normal in less than 12 hours (14). The ammonia vapors dissolve immediately in the moist of the skin, eyes, oropharynx, larynx and lungs, in the shape of hydroxyl ions that cause chemical burns through the liquefaction necrosis. The severity of the lesions is directly associated to the concentration and duration of the AA exposure (14). Macroscopically, we confirmed, in necropsy, that there occurs an intense congestion of the trachea and bronchia mucosa surface. All the pulmonary divisions present with cylindrical bronchiectasies, and affect mainly the middle and lower lobes. Microscopically, the bronchial mucosa was replaced by the granulation tissue and large areas had the epithelium removed. Ulcerated parts and squamous metaplasia were present in the bronchial subsegments. The bronchiectasy was associated to the destruction of the mucous glands, the soft musculature, the cartilage and the replacement for vascular fibrous tissue. Each bronchiole presented with a soft periadventitial fibrosis or an aspect of obliterating bronchiolitis. There was congestion, hemorrhage and unequal edema of the alveolar tissue (2). The extension of the respiratory lesions after inhalation of AA depends on the exposure duration, gas concentration and inhaling depth. For being highly soluble in water, the ammonia is quickly absorbed by the mucous membrane, by reacting with water to form the ammonia hydroxide that is highly irritating and caustic. The burns and desquamations of the epithelial layers of the bronchial tree (tracheobronchitis) are frequent. The absorption of ammonia by the upper airways somehow protects the lower bronchia and the alveolus from its toxicity (5). In patients who died immediately after AA inhalation, they observed edema and hemorrhage in the larynx and lungs. In patients interned, it was confirmed within a few days, that it superposed on bacterial infection. Those who survived from the acute lesions may present or not evidences of obstructive pulmonary disease, with bronchiectasies and obliterating fibrosis of the lower airways (11). The initial treatment for whom inhaled AA consists of antibiotic therapy, bronchodilators, corticosteroids and oxygen inhalation (5). In the most severe cases, we recommend the nasal or orotracheal intubation and, if applicable, tracheostomy. After intubation, the lower airways lesions are controlled by positive end expiratory pressure (PEEP) (14). Through laryngoscopy, we observed that, after AA inhalation, we may find since diffuse erythema and edema of lips, soft palate, posterior wall of the pharynx and epiglottis, up to first, second and third degree burns in the oropharyngeal, hypopharyngeal and laryngeal cavities (1-9). After 15 days, we may note, on the soft palate mucosa, portions with fibrin and diffuse edema with fibrinous exudate in all the oropharyngolarynx. After 60 days, we observed an improvement of dysphonia and the laryngoscopy revealed a sight vocal cords edema (1). Some sequelae were observed that consisted of damages to senses (taste, hypalgesia or vision), severe dysesthesia, voice change, loss of pulmonary function, cerebral anoxia and death (3). The AA gas inhalation results in a glottis spasm that, in one hand, may prevent the smoke from reaching the lower airways, but, in the other hand, maintains the gas in contact, for a longer time, with the glottic and supraglottic region, and may lead to a more profound burn of this region. The very defense reflex contributes to worsen the damage to the larynx. Despite the burns for alkalis result in an exothermal reaction when in contact with water, by releasing heat, the prolonged irrigation neutralizes the AA toxicity, and normalizes the injury pH. The sooner the hydrotherapic treatment is started in the affected parts, in order to neutralize the burns caused by alkalis, the better the treatment results will be. Corticosteroids and antibiotic therapy must also be used. In the most severe cases, intubation and tracheostomy are necessary with mechanical ventilation. Due to the difficulty to obtain the exposure time and consequently the AA inhaled and the severity of the sequelae presented, we recommend the performance of periodical laryngoscopy examinations, at least during six months, for evaluation of the larynx that may present since chronic laryngitis up to glottic stenosis with high respiratory insufficiency. 1. Close LG, Catlin FI, Cohn AM. Acute and chronic effects of ammonia burns of the respiratory tract. Arch Otolaryngol. 1980, 106:151-8. 2. Price SK, Hughes JE, Morrison SC, Potgieter PD. Fatal ammonia inhalation. A case report with autopsy findings. S Afr Med J. 1983, 64:952-5. 3. Wibbenmeyer LA, Morgan LJ, Robinson BK, Smith SK, Lewis RW, Kealey GP. Our chemical burn experience: Exposing the of anhydrous ammonia. J Burn Care Rehabil. 1999, 20:226-31. 4. Edlich RF, Farinholt HM, Winters KL, Britt LD, Long WB, Werner CL, Gubler KD. Modern concepts of treatment and prevencion of chemical injuries. J Long Term Eff Med Implants. 2005, 15:303-18. 5. Leduc D, Gris P, Lheureux P, Gevenois PA, De Vust P, Yernault JC. Acute and long term respiratory damage following inhalation of ammonia. Thorax. 1992, 47:755-7. 6. Felix EP, Cardoso AA. Amônia (NH3) Atmosférica: fontes, transformação, sorvedouros e métodos de análise. Química Nova. 2004, 27:123-30. 7. Schvartsman S. Cáusticos. Em: Schvartsman S, editor. Intoxicações agudas. 4ª. ed. São Paulo: Sarvier; 1979, pp. 179-83. 8. Hygienic Guide Series. Anhydrous ammonia NH3 (Revisão 1970). Am Ind Hyg Assoc J. 1971, 32:139-42. 9. Millea TP, Kucan JÔ, Smoot EC. Anhydrous ammonia injuries. J Burn Care Rehabil. 1989, 10:448-53. 11. Sobonya R. Fatal anhydrous ammonia inhalation. Hum Pathol. 1977, 8:293-9. 12. Burns TR, Mace ML, Greenberg SD, Jachimczyk JA. Ultrastructure of acute ammonia toxicity in the human lung. Am J Forensic Med Pathol. 1985, 6:204-10. 13. Latenser BA, Lucktong TA. Anhydrous ammonia burns: case presentation and literature review. J Burn Care Rehabil. 2000, 21:40-2. 14. Edlich RF, Farinholt HM, Winters K L, Britt LD, Long WB, Werner CL, Gubler KD. Modern concepts of treatment and prevention of chemical injuries. J Long Term Eff Implants. 2005, 15:303-18. 1. Master's Degree in Medicine - Head and Neck Surgery - at HOSPHEL. Head Doctor of the Otorhinolaryngology Service of the Hospital da Sociedade Portuguesa de Beneficência de Santos. 2. Phonoaudiologist at the Universidade Lusíada de Santos - UNILUS. Phonoaudiologist of the Sociedade Portuguesa de Beneficência de Santos. Institution: Sociedade Portuguesa de Beneficência de Santos. Santos / SP - Brazil. Article received on May 04, 2008. Approved on February 9, 2009.